During Sports week, the children have participated in some truly memorable activities. They have learned how skipping can be fun, tried new sports and listened to two inspirational speakers. Our first activity was a Skip2Bfit session. In this session children were taught how to skip. They then completed the skip to be fit challenge where they recorded how many skips they could complete in 2 minutes. The children then repeated the challenge where they were encouraged to show a Growth Mindset and beat their personal score from the previous attempt. The children and staff were fantastic and showed real enthusiasm! Special mention should go to Caia Stockdale in 4S. She completed 270 skips in two minutes! The second activity was a Kin Ball session. 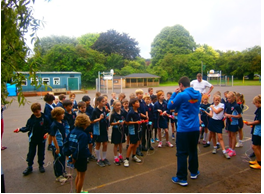 In this session children learnt about a new sport called Kin Ball which originates from Canada. 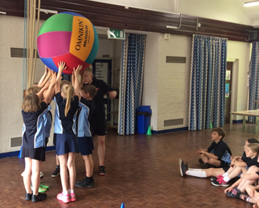 The idea of the sport is to work as a team to catch and balance a large inflatable ball so it does not touch the ground. This was a fantastic experience for children to experience and enjoy. On Wednesday we were lucky to welcome Olympian and Britain’s greatest (in our opinion) gymnast Beth Tweddle. She came and spoke to the school in assembly about her achievements, importance of physical activity and never giving up. After the assembly some very lucky children were randomly selected to participate in a coaching session with Beth, in the coaching session she shared her top tips and trade secrets. 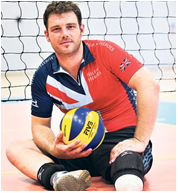 On the following Tuesday we had Anthony Harris speaking to the children in assembly about his participation in the 2014 Invictus games, where he won a gold medal in the Sitting Volley ball. He spoke about how sport had a positive impact on his life. What a fantastic week. We cannot wait for next year!